Sources have now confirmed that there will be a Walter P. Chrysler Anniversary Package for the flagship Chrysler 300/300C. 2015 marks 90 years since turnaround artist Walter P. Chrysler created an empty shell of a company to buy the full assets of Maxwell Motors, which had already started making Chrysler branded cars in 1924. In the ensuing years, the Maxwell car would be renamed the Chrysler Four for a single year before being rebranded as the Plymouth. The contents of the package are still unknown, but past Walter P. Chrysler packages (including the one pictured) have generally included extra badging and “free options.” It is not due for production until fall, but ordering should be open in July or so. Maxwell Motors, the company which made the first Chryslers, was founded in 1904, so that Chrysler could be said to be 111 years old now. Maxwell was the lead company of the United States Motor Company, founded in 1910 to compete against the fledgling General Motors, along with Dayton (1905), Stoddard (1904), Sampson (1904 but based on Moyea, founded in 1902), Columbia (which acquired Pope Motor Carriage, founded in 1899, and also went back to the Riker Electric Motor Company, founded in 1884), and Brush (1906). United States Motor lasted for three years before changing its name to Standard Motor, a change which lasted less than a year, when it was taken over and named to Maxwell Motor Company, after its most (or only) successful brand. Along the way, it absorbed Flanders Motor. Is it any wonder American consumers ignore large cars and instead shop the abundant crop of functional, sometimes sporty CUVs? WardsAuto’s Large Car segment is a lonely place, with only four entries, and sales through March are down 14% while the car market overall is flat, according to WardsAuto data. Two years ago, the newest entry was the Chevrolet Impala, which is very sharp, but it didn’t win a Ward’s 10 Best Interiors trophy because the interior is less compelling than the beautifully sculpted sheet metal. The same cannot be said of the refreshed Chrysler 300, which carries over many of the styling cues, inside and out, that have made it a perennial contender, while integrating a number of meaningful improvements. The Chrysler 300 makes big sedans relevant once again and even tips its hat, by way of a nearly identical color scheme, to a high-end interior that dazzled us last year: the $122,895 Mercedes S-Class sedan. The 300C Platinum rolled into our garage with a more palatable $51,175 price tag and, like the S-Class, parlays gorgeous satin metallic trim, quilted leather, excellent fit-and-finish and a first-rate human-machine interface that is easy to learn and simple to use. With its latest Uconnect system, Fiat Chrysler makes what appears to be simple work of the HMI, which can be daunting because automakers need to incorporate so many functions within the central display screen to eliminate buttons from the instrument panel and center console. But the 300 is much more than cool electronics. From the white-faced analog clock to the heated rear seats, the cabin is roomy, welcoming and luxurious. “In a world overpopulated with giant SUVs, the Chrysler 300C Platinum reminds us how glorious big sedans can be,” writes WardsAuto editor Drew Winter. “The ’15 model takes the award-winning interior of the previous version up another notch with even more features, comfort and sumptuous materials. It also has wonderfully practical details, such as stout grab handles and a truly sturdy sunglass holder,” Winter says. For what it’s worth, Fiat Chrysler kinda owns the big-car segment. The 300’s platform mate, the refreshed Dodge Charger, is the only entry in the sector posting gains through the first three months, up 5% to 26,218 units, according to WardsAuto data. The Charger is duking it out with the Impala for the No.1 sales slot, while deliveries of the 300 are flat. The Ford Taurus, overdue for redesign, brings up the rear; its sales are down 27.6% for the quarter. 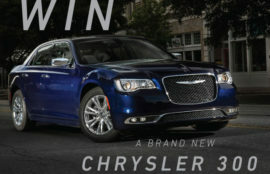 Yes, the Charger also was in the competition this year, but we opted instead for the 300’s soothing, upscale persona. “I could live in this car,” says one judge. And live well. Quick! Name an American, rear-drive, V-8–powered, full-size sedan. If you said, “Chrysler 300,” you’re only 15 percent right, because that’s the proportion of 300 buyers who actually opt for the V-8. The rest decide that the V-6 will suffice, a strong indicator that while the model name may be rooted in a high-performance heritage, the car sells mostly on its styling, size, and value. All the same, the V-8 is key to the car’s image so that’s the version we sought out first—in both the 300C and sportier 300S trims—to sample on roads in and around Austin, Texas. A decade after Ralph Gilles’s design for the 2005 model caused an industry sensation, the 300 has been revamped a second time, with new nose and tail treatments featuring redesigned lights and a 32-percent larger grille, a fresh interior, and an eight-speed automatic operated by a rotary dial on the console. The EPA combined fuel-economy rating goes up 1 mpg to 19 (16/25 mpg city/highway) with the new transmission, the quicker shifting of which Chrysler says will also improve performance even though the engine is unchanged. The 300 got a thorough redo in 2011, but for 2015 it gets no new sheetmetal, unlike its platform-mate, the Dodge Charger. It does add another trim level, the 300C Platinum. The C, S, and C Platinum all offer the V-8 as an option but the engine is not available on the base Limited, adding a perhaps-unintended layer of meaning to that version’s name. Checking the option box for the 5.7-liter V-8 costs $3000, which gets you not only the 363-hp Hemi, but also bigger brakes (with dual- rather than single-piston calipers up front and ventilated rather than solid rotors in back) and a 160-mph speedometer. The 300S also gains a decklid spoiler, while C and Platinum trim levels get the paddle shifters that come standard on any S. This year, the V-8 can no longer be paired with all-wheel drive, owing to that combo’s abysmal take rate; evidently, people who already commit $2500 extra for AWD are disinclined to throw another three grand at the lump under the hood. Brand president and CEO Al Gardner’s marching orders for Chrysler are to square up more directly against the industry’s volume-sales leaders, including Ford, Chevrolet, and Toyota. As Chrysler’s flagship, the 300 still has some near-luxury pretensions, but the sharpened focus gives Dodge precedence as the “performance” brand. This goes some way toward explaining the lack of a U.S.-market SRT8 version. The SRT8 will survive in some foreign markets, but its price point exceeds (and its sales volumes fall far short of) Chrysler’s targets for North America. A pity perhaps, but mainstream buyers in search of a V-8’s bellowing torque still have the 5.7-liter and its 394 lb-ft to lust after. New mechanical elements are the eight-speed gearbox, electric-assist power steering, and a retuned suspension using aluminum components. Aside from the rotary-dial gear selector much like the one on the Chrysler 200, prominent changes inside include a handsome new steering wheel, a new instrument cluster, and a redesigned center stack. There’s a good division of labor between the 8.4-inch UConnect touch screen and the button interfaces, although we grew frustrated by a radio we couldn’t turn off—the volume can be muted, but it repeatedly reactivated itself without our bidding. Also, the heated-seat controls are buried in the touch-screen menu rather than given dedicated buttons; partially offsetting that annoyance, a seat-heat icon appears on-screen when you first start the car, so you can avoid the irritation if you’re quick. Supplementing that screen is a new 7.0-inch driver-information display nestled between the tach and speedometer. As long as you’re okay with the dial-a-gear setup, the controls are all easier to figure out and use than in the previous model, even with the added indicators and buttons for the new electronic driver aids, which include adaptive cruise control with full-stop ability, lane-departure warning, lane-keeping assist, forward-collision warning, and brake assist. These are contained in the SafetyTec 2 package, a $1695 option; SafetyTec 1, also at $1695 and required to get SafetyTec 2, brings parking assist, blind-spot and cross-traffic alerts, as well as forward-collision and adaptive cruise. The first V-8 we drove was a 300C optioned up to $47,170 with all the electronic assists, Touring suspension, and 20-inch wheels wearing 245/45 all-season performance tires. It’s a handsome car in the more traditional Detroit mold with plenty of chrome trim and, as configured, most of the driver-oriented hardware that comes on a 300S, excluding only that version’s tauter suspension. The 300C proved to be a comfortable, relaxed commuter through Austin’s dense urban traffic despite a bit of road noise from the performance-grade rubber; standard 18-inch wheels with touring-grade tires are a better choice for the comfort-seeker. Once we got out into Texas Hill Country and the winding two-lane roads that make the region a driver’s delight, the latest 300 was eager to demonstrate that, like its predecessors, it can handle much better than you’d ever expect of a 4350-pound four-door. To get the best out of it, turn the gear selector to “S,” which delivers crisper shifts and allows the driver to take full control of the eight gears via the paddles—it lets you bump against the rev limiter rather than shifting itself at redline. Our complaints of lazy shifting in previous 300s have been addressed, especially with the dial in S. Whether the driver calls for them or lets the transmission think for itself, gearchanges are crisp, taking only 250 microseconds, according to Chrysler, versus 400 for the previous model with its five-speed automatic. The only flaw is that Chrysler’s paddles are small, sharing back-of-the-wheel space with audio-system buttons, making it too easy to change radio stations rather than gears. There’s also a Sport button on the center stack that calls up more-aggressive programs for the throttle and steering response. Speaking of the latter, Chrysler seems to have done its sums right with the electric-assist steering. You wouldn’t call it communicative, but at its worst the feel is as good as that delivered by the previous hydraulic unit, and sometimes it’s better as full electronic control allows for sharper reflexes when you’re going hard without imposing any burden in parking maneuvers. It’s also adjustable through three settings via the center screen. While the Platinum layers on more luxury, the driver’s choice remains the 300S with the V-8. Our test example had the 300S Premium Group option pack ($3295), including a dual-pane panoramic sunroof, navigation, the big UConnect screen, the SafetyTec 1 features, satellite radio, and so on. Other notable options included a $895 Light Group with self-leveling HID headlamps, SafetyTec 2, and a roof painted black to contrast with the Redline red paint ($1500). Not all of that is essential gear, so it’s clear you can get the driving goodness of the 300S without spending the full $46,275 on this car’s sticker. That’s worth considering because at that price, you’re head-to-head with the Chevrolet SS, which comes fully loaded at its base price and now offers your choice of manual or automatic transmission. Also important, the Chevy is several hundred pounds lighter and a better performer overall. The Chevy might not interest those into the 300 look and the Hemi heritage, but the keen drivers for whom that car might be an option should know that the tighter suspension in the 300S is worth having—with it, the car took a quicker set into a corner and was less inclined to pitch or roll than was the otherwise similar 300C when the back roads took on the contours of a stormy sea. The 300S’s attendant blacked-out trim and unique grille texture are more matters of taste. Chrysler kept reminding us that the 300 model name turns 60 years old in 2015, harking back to the original C-300 of 1955. Sixty years ago, its 300 (gross) horsepower was a bunch of power and the C-300 was a bunch of car. It was also an early exemplar of a car company mating luxury and style with performance. Even with the SRT8 version gone, the 2015 model combines respectable performance, elegant styling, useful technology, and surprising agility at a reasonable price. If it’s the V-8 configuration you want, this may be the time to step up. When FCA finally gets around to a clean-sheet redesign—expected for 2018—the V-8 will probably be even more rare, and more expensive, than it is now.